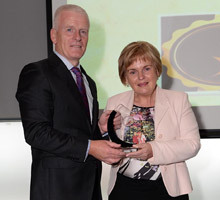 A large number of innovative projects which improved patient care and services were entered for the HSE Community Healthcare West Staff Recognition Awards in 2018, Mary Heaney, Project Manager for Staff Recognition Programme, Community Healthcare West, told a HMI Regional Meeting in Galway last Wednesday. Maureen Browne reports. Ms. Heaney said the awards were introduced to recognise staff achievements, to inspire staff to develop better health and social services, to showcase achievements and to ‘Share the Learning’. Aimée Walsh, Amy Corbett, Martina Hughes and Noelle Sammon. 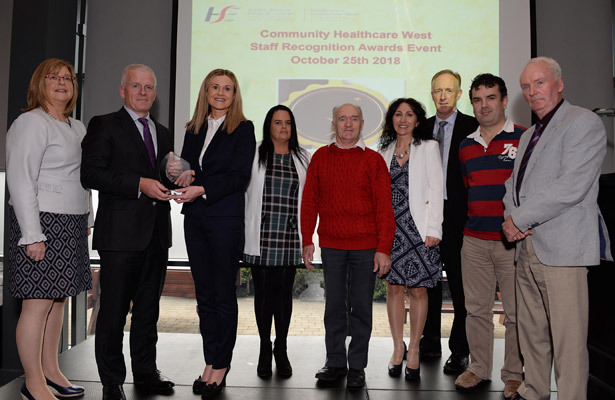 The awards were open to all staff working within Community Healthcare West (Galway, Mayo & Roscommon) and to all HSE staff providing services directly or indirectly across Community Healthcare West. A total of 61 entries were received. Overall Winner Innovative Project: Heartsaver CPR AED Training for Family Carers. Elaine Prendergast, Head of Social Care Community Healthcare West, Tony Canavan, Chief Officer, Community Healthcare West, Michelle Harrison, Co-ordinator, Carers Department, Social Care, Sabrina Crowe, Carers Department, Social Care, Patrick Lardiner, Family Carer, Catherine Sheridan (Coordinator Croi Centre for Life Saving Training), Neil Johnson (CEO Croi- West of Ireland Cardiac Foundation), Ian Mc Loughlin, Family Carer, Daniel Mc Namara, Family Carer. The Judging Panel consisted of Dr Diarmuid O’Donovan, College of Medicine, Nursing and Health Science (Clinical Nominee) representing NUIG, Grainne Colreavy, representing HBS, Therese Cunningham, HR Manager, Cavan Monaghan representing CHO1 and Mary Garvey, General Manager, Roscommon University Hospital, representing Saolta. Applications were accepted between April 16 – July 11, 2018. Of the 61 applications, 20 were from primary care, 18 from mental health, 6 were from social care, 2 from finance, 3 from HR, 2 from support services and 1 from health & wellbeing. Tony Canavan, Chief Officer Community Healthcare West and Helen Byrne, Clinical Nurse Specialist Addiction, Mental Health Services Castlebar. Ms. Heaney said there were 19 winners across three Categories. Six winners were in the Innovative Project category, 7 in the Service Improvement category and 6 from the Exceptional Service/Unsung Hero category. 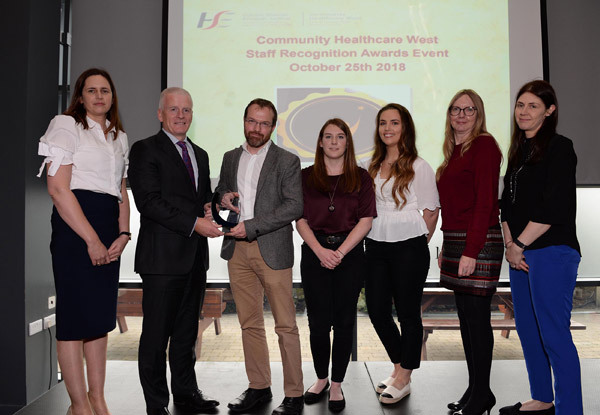 The winners were presented an award by Mr. Tony Canavan, Chief Officer, Community Healthcare West, at a Recognition Event in Galway, attended by 180 people. Seven of the winners came from primary care, 3 from social care, 7 from mental health services, and 2 fell into the “other” category. Category 1 – Innovative Project. Overall winner in this category – Heartsaver CPR AED Training for Family Carers – Social Care Services, Newcastle Road, Galway. Community Partnership Model for Occupational Therapy Service delivery in School – Primary Care Galway. The Eden Programme – Mental Health Services. Patient Flow Quality Improvement Initiative. Nursing Discharge Information Galway University Hospital to Liaison Public Health Nursing. Overcoming Incontinence after Prostate Cancer, An Integrated Approach to Continence Care for Men in County Roscommon – Primary Care Centre Roscommon. 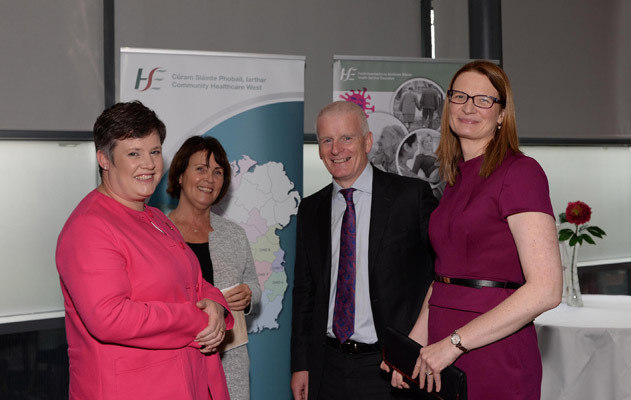 Grainne Colreavy, Health Business Services (HBS), Therese Cunningham, CHO1, HR Manager, Cavan Monaghan, Tony Canavan, Chief Officer, Community Healthcare West and Mary Garvey, General Manager, Roscommon University Hospital. Category 2 – Service Improvement. Overall winner in this category) – Access to Psychological Service in Ireland – Primary Care Centre Roscommon. Efficient Management of Step-down beds without Compromising Care Standards – Ballinasloe Community Nursing Unit. Community Intervention Team Galway – Primary Care Services, Galway. Influenza Vaccination Campaign – Bellmullet Community Nursing Unit. Bullying prevalence and impact on self-esteem, mood and anxiety levels in 2nd year students, risk management and psychological follow up in a primary care Psychology service, Team Primary Care Centre. Life Story Book Mental Health Services – Mental Health Services Ballinasloe. An evaluation of the operation and effects of the Mental Health Act 2001 from the view-points of service users and health professionals – Galway Roscommon Mental Health Services. Category 3 – Exceptional Service – Unsung Hero. Overall winner in this category – Helen Byrne, Clinical Nurse Specialist Addiction, Mental Health Services. Michael Quinn, Multi-Task Attendant , Mental Health Services. Lorna Sumner, Clerical Officer, Finance Department, Galway. Catherine Walsh, Principal Social Worker. Sean Fergus, Head Gardener, Merlin Park Hospital. Applicants not shortlisted for an award received a letter from the Chief Officer. Mr. Seamus Gallagher, Secretary, HMI West, thanked Ms. Heaney for her very interesting presentation. He also thanked all those who had attended the meeting and urged any non HMI members to consider joining the Institute.